OKAY GUYS. I'm not a crazy, green conspiracy theorist, I promise! But with how much I've ended up loving natural deodorant AND after finding a very cheap, easy alternative to the organic, store-bought brands, I just had to share. This past summer, I started using Tom's Natural Deodorant instead of the aluminum and chemical-filled deodorant sticks that I had routinely picked up at the store since Mother Nature played what is the cruelest joke ever on the human female body (i.e. puberty). Why the change? With our struggles getting pregnant because of my whacked-out hormones, I learned a lot about how my body works and how sensitive and interconnected the body's wiring is. More importantly, I learned that a lot of what I was putting ON and IN me was mimicking estrogen, making the whole PCOS imbalance even worse - this included the necessary, daily application of B.O. blocking deodorant. So, I made the switch to natural deodorant and ended up growing to LOVE it! In fact, I found that after a short adjustment period, it ended up working BETTER than your typical deodorant stick. Now, I will admit that there were about 4 days that I was about to give up on the natural stuff because it just didn't seem to be working as well. Put bluntly, my armpits felt like the Florida swamplands - damp, sticky, and not-so-pleasant on the senses after a full day of activity. What I came to realize, though, is that my body had rewired itself to expect those chemicals every day, so the same way using Chapstick necessitates the need for more Chapstick, using OTC stick deodorant actually made the goings-on under my arms worse. Once my pits went back to their natural state, though, I sweated less, I smelled fine even without deodorant, and I felt better knowing I was avoiding putting unnecessary chemicals on/in my body. I know this isn't an option for everyone, but for me, using natural deodorant has been a WONDERFUL change! 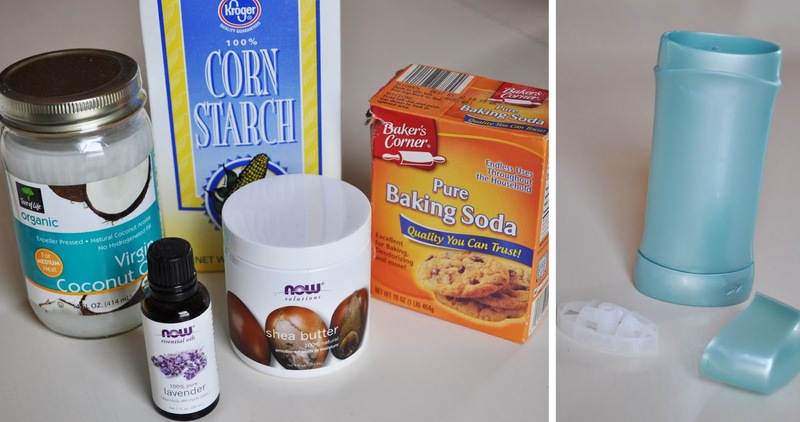 So I was content to pick up a stick of Tom's from the drugstore until a friend of mine mentioned making her own natural deodorant (using these recipes). Given my love for essential oils and saving money, I just HAD to try it. I made a few adjustments, and came up with a recipe I absolutely love! 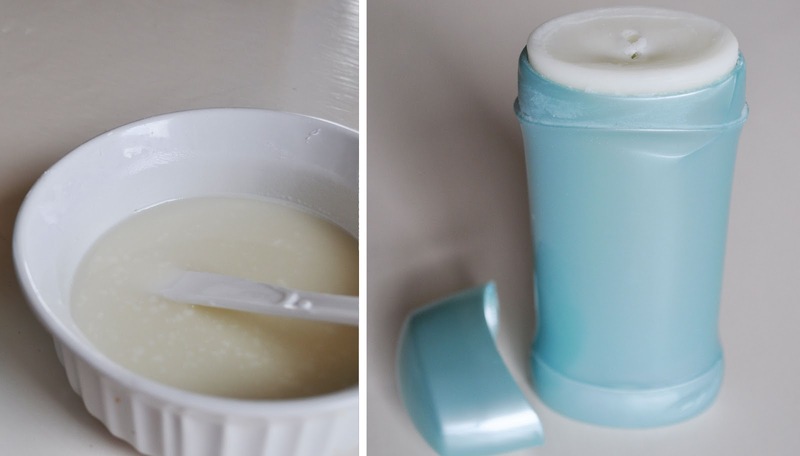 - Place your coconut oil & shea butter in a glass jar. 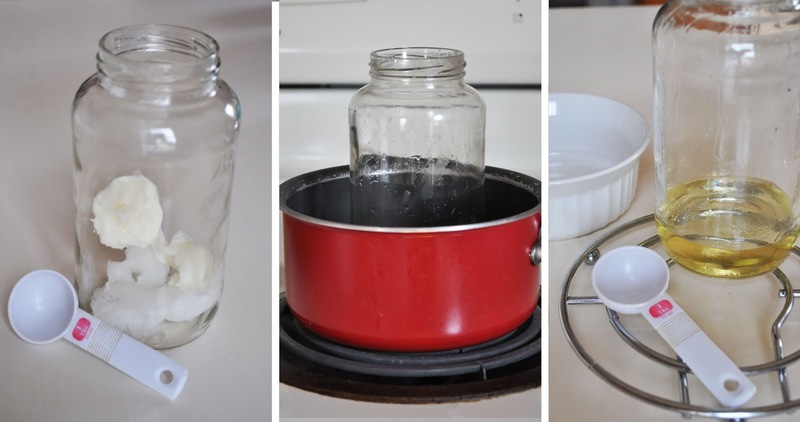 Heat water in a saucepan, and place your jar in the saucepan to heat the oil & shea butter mixture until just melted. 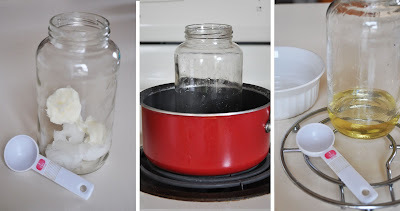 Doing it this way cuts out the need for a double-boiler and allows you to use a dedicated jar for mixing up your deo. - Remove from heat and add baking soda & corn starch. Mix until smooth. (I didn't have a small jar for the first step, so I had to pour my melted mixture into a small mixing bowl for this step). - Add your essential oils if desired. Lavender, mandarin, lemon, rose, or sandalwood are good choices. I used 9 drops of lavender and 4 drops of lemon and really love the combination! - Let cool completely and harden slightly before pouring into your old deodorant stick to harden completely. I got antsy and ended up hardening mine in the fridge to expedite the process once I poured it into the old deodorant stick. And that's literally all it takes. 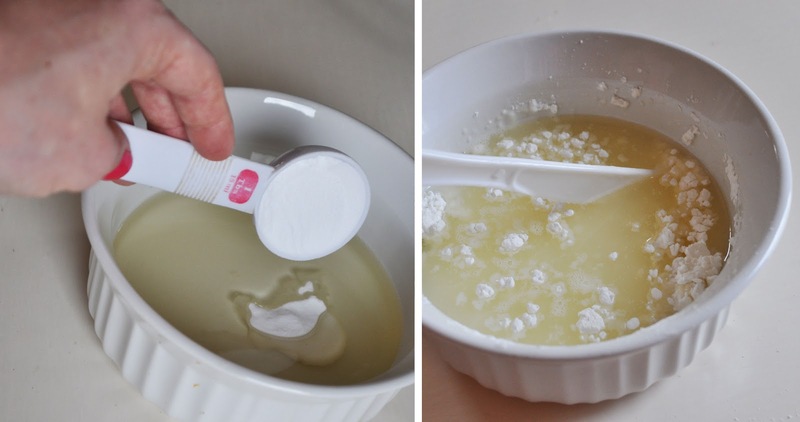 Easy, painless, and mega-cheap! With this recipe, there's no need to store it in the fridge to keep it hardened ordinarily; however, if it's a hot summer day and you don't have the AC running, it may be a good idea to stick it in there to avoid a meltdown. Along those same lines, I have a feeling this deo won't travel well (flying or in the summertime) because of the melty nature of the coconut oil, so you may want to pack up the Tom's for that Caribbean vacay. Keep in mind that a little goes a long way with this stuff and it does melt a little on contact because of the coconut oil, so there's no need to apply it with a heavy hand. Just give those pits 1-3 gentle strokes, do your best running man to "rub it in," and then go on your merry way. I've found that I actually like the temperament of this recipe because it goes on super easy and you don't get the weird pilly crap that sometimes materializes with normal deo sticks (i.e. Degree & friends). If you do try this recipe, definitely let me know how it goes! Share your scent combos, thoughts, and adaptations below.